Adamthewayne, nice work on correcting the top of the quarters od the Olds and your Dodge looks nice too. Try Tamiya white TS spray paint. I have never gotten a bad paint job with Tamiya TS sprays. Thank you for the compliments sir. I have recently tried a couple Tamiya paints. I was quite impressed. I just haven't tried white or black yet. I used Tamiya black and white on this Chevy Black Widow. I'm with you martinfan, absolutely zero interest in this kit. My interest was peaked however a month ago when all the "it's almost done" starting coming out on the boards. I thought, hmmm, maybe this would be a fun little kit to build and something out of my "norm", now I'm glad I didn't jump on it when I was about to. If this kit was what we were promised, I would of bought it, just to support JR, because maybe a future project from them would of been something I would of been interested in, but no way I am going to spend close to $50 after factor in shipping on what is 70's tooling with a sheet of Powerslide decals. If people are happy this kit, great!! 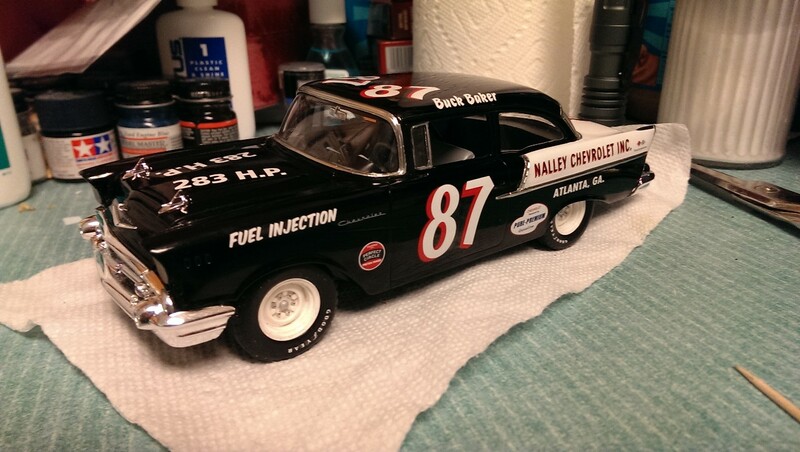 !, I hope you enjoy building it, but for me, nope, its not worth $35, its barley worth $20 if you take out the Powerslide decal sheet, what a massive disappointment for many in the NASCAR modeling community that have some standards. Is anyone interested in talking about what car you are planning on building with this kit? If not, please go elsewhere and post. Trying to stay positive. Agreed 100%, I'd like to do Cale and Donnies Daytona cars from 1979. Plus Lobograghix makes an excellent sheet for Waltrips S3 Laguna. I'm thinking their sheet would be a nice fit for the Olds. I'll massage the body a bit & maybe look at alternative chassis'. Though I appreciate the efforts of the reviewers above in illuminating points to ponder, the rubber hits the road when the kit hits the bench. It's not anyone's job other than the mods to tell anyone where to post. I'm not home but this evening I will make a thread in the tips section for the 442, its errors, and fixes . Discussion thread for this kit pertaining to tooling issues , errors, and possible fixes is now up in the Tips and Tricks section. Do not post there on general topics such as what car you are building with what decals. It's for the nuts and bolts of the kit.